This 200 year old cottage has many traditional features whilst being well equipped with modern facilities including washing machine / dryer, dishwasher, microwave, WiFi, CD player and DVD player. Based over three floors, the cottage is light and airy with views over the village and countryside beyond. It has central heating and a wood burning stove. The village of Stratton has two pubs and a village store, and is just one mile from the coastal town of Bude with extensive sandy beaches, sea swimming pool, leisure centre, surfing and a wide variety of shops, pubs and restaurants. There is also a range of golf courses in the vicinity. Stratton is a great base from which to explore many of Cornwall and Devon’s attractions including the Eden Project and the Lost Gardens of Heligan. We live is Sheffield and have two children aged 11 and 5. We spend a lot of time at the cottage and hope that our guests enjoy it as much we do. We bought Waterloo Cottage four years ago after staying in it on holiday for two years running and falling in love with it at first sight. We love the traditional features of the cottage coupled with the modern feel we hope we have achieved. We still love the cottage, the village and North Cornwall and have not been on holiday anywhere else since! The cottage is in a lovely location in the centre of the village so it quiet without being isolated. Stratton is a great village with friendly people, convenient village store and great pubs for food and drink. The cottage also provides great access to the whole area with fantastic beaches at Bude (particularly for little ones), Widemouth Bay and Millook and for all the other attractions that Cornwall offers. Bathroom with sink, bath and electric shower over. Separate WC. Extensive living room with view over the countryside. TV, DVD player, Freeview and selection of books and games. Kitchen with breakfast table seating 4. Fully equipped kitchen with gas hob, electric oven, dishwasher, microwave, washing machine / tumble dryer, fridge/freezer and CD player. There are three local golf courses within 3 miles of the village. Notes on accommodation: Please note no pets are allowed at the property Outside: There is a small sun trapped patio at the front of the property which is enclosed therefore suitable for children. Cleaning / Towels / Linen / Maid service: Bed linen is provided. Towels are not provided or available. Lovely old cottage in quaint village location. The cottage was cosy and very quick to warm up. It was larger than expected from the photographs, we particularly enjoyed spending time in the upstairs lounge. Well equipped kitchen, found everything we needed. My daughter enjoyed playing the board games and I enjoyed reading the books on the local area. Wifi connection was strong. Parking can be a bit difficult at times, though did manage to park close by. 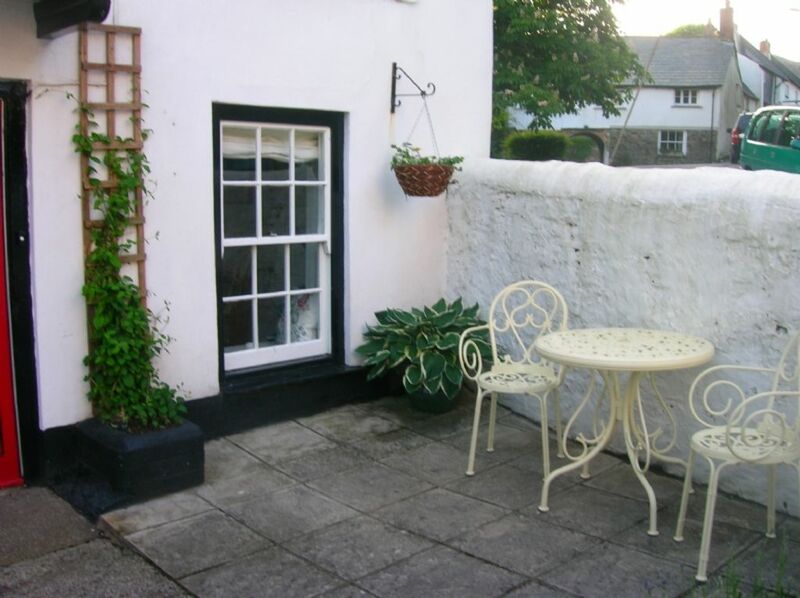 Very pleasant cottage in a superb area , A great base for exploring north cornwall and south devon . A shame about lack of wifi and steep stairs but overall was very happy with the cottage . Many thanks for the lovely review. We are glad enjoyed the cottage and the surrounding area. We will be looking into getting WiFi for the cottage in the near future. Thanks again. We stayed here in September 2015 for two weeks having visited Bude the year before. The cottage is stunning! It's spotlessly clean and right in the middle of the village. Yes it's a bit of a pain to park and yes the top flight of stairs are a bit steep but it's really no big deal. We managed to park on the street directly outside every single night and spent most evenings in the kitchen listening to music with a bottle of wine. We also took our son who was just under 18 months old at the time. There was a cot and highchair available which was really helpful. We had a couple of queries when we arrived. The owners responded straight away and couldn't be more helpful. We loved it so much we're going again in 2016! The property was clean and the top lounge is very airy with wonderful views. The beds are comfortable and linen was fresh. However the property in my view would not be suitable for those with mobility issues or with young children as the second stair case is very steep. The bathroom and toilet are on the ground floor and although functional are not places you would spend any time longer than absolutely necessary. Parking and can be an issue on the roads however there is a car park with an approx. 5 minutes walk back up hill to the cottage. We liked the character of this old building and and its location in the village next to the church. It's well equipped. The living room is cozy and spacious. Unfortunately there was no WIFI although this was said to be there in the advertisement. We counted on it for getting information about exploring the region. Many thanks for the review, I am so glad you enjoyed your stay. Apologies for the lack of WiFi. There is WiFi at the cottage but unfortunately this had been affected by problems with the cabling outside of the property and although reported, the engineer could not repair it during your stay. It is now fixed. The cottage is just over 1 mile from the wide sandy beaches at Bude which includes the famous sea pool. The beach is extremely safe for children. Bude is renowned for excellent surfing. Widemouth Bay and several other beaches are accessible within 15 minutes by car or on foot along a coastal path with views across the Atlantic. Stratton is situated in an ideal location for accessing the key attractions in Cornwall and North Devon. The nearest airport is at Newquay. The cottage is at the centre of the historic village of Stratton with a selection of pubs and places to eat within 500m. Stratton has a village shop, post office and a range of pubs and restaurants. Bude, just over a mile away has a good selection of shops, restaurants, supermarket and leisure activities including an outside sea swimming pool and indoor leisure centre. Booking Notes: Booking taken for full weeks or long weekends / short breaks. Bookings usually start on Saturday unless in low season where there may be more flexibility. 50% deposit is required on booking with full payment required 6 weeks prior to the start of the holiday. Bookings can be made by telephone or email but are not secure unless deposit has been accepted. Payment by cheque, bank transfer or paypal only. Changeover Day: Changeover day is Saturday. The cottage is available from 3pm on the date of arrival and guests are asked to leave by 10am on departure day. Notes on prices: Prices are for the property per week in UK pounds. Bookings taken for long weekends / short breaks outside of peak periods. Please contact for rates and availability.